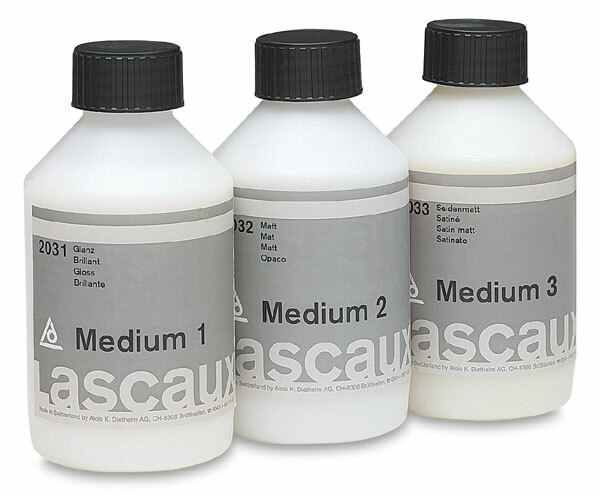 Create a myriad of unique, customized textures, finishes, and special effects with Lascaux Acrylic Mediums, formulated with the same dedication to performance and quality as Lascaux Acrylic Paints. All mediums are acrylic-based and can be safely mixed together. These fluid mediums are made with pure acrylic resin emulsion (Mediums 2 and 3 also contain silicic acid). Mix them with acrylic paints to increase transparency and adhesion, slow drying time, and extend yield. Lightfast, colorless, and age-resistant, they are ideal for creating glazes and also excellent for embedding lightweight collage materials. Medium 1 dries to a waterproof, clear gloss film and may be used as a final varnish (though it dries to a softer film than Lascaux Varnish). Medium 2 dries to a waterproof matte film and is also excellent as a colorless sizing or primer for canvas and paper. It is not recommended for use as a varnish. Medium 3 dries to a waterproof, transparent, satin matte film and will not change the sheen of the paint when added to acrylics. It may be used as a final satin gloss varnish.